Copyediting and Agents and Gardens, oh my! Received the copyedited version of Book 1 last week and have been steadily working my way through it, checking to make sure all my i’s are dotted and t’s crossed. I’ve never seen something professionally copyedited before, so it’s fascinating to see how someone who really knows their English has interpreted my sometimes loosey-goosey language. I’ve learned two things from this: a) that I overuse commas and hyphenated compounds like no tomorrow, and b) I’m not too shabby at self-editing. I really expected this copyedit to be covered in red marks and notes from the copyeditor that said stuff like “DEAR GODS, WHAT DID THIS WOMAN DO TO OUR LANGUAGE? !” Instead, there are relatively few marks, and I’m actually learning a lot from this about my own bad habits. I was always told (by published writer-mentors) that a good copyeditor is a valuable resource in the publication process, and I can see why they say that now. I really like this guy. On another note — I’ve raved here and elsewhere about my phenomenal agent, Lucienne Diver. I saw her again this weekend past at Lunacon, where we had lunch and she talked me down from a minor panic re The Future Of My Career, etc. Now, I don’t know if all authors want an agent who can do things like that for them — offer emotional support along with mad contract-negotiating skillz, etc. But for me, as a new author who’s still very unsure of herself professionally and still trying to figure out how this crazy business works, the personal touch really helps. Case in point: on the day I got the first offer for 100K and its sequels, I was at work, which she knew, but she also knew how anxious I’d been about whether there would be an offer, so she called anyway. She asked me, “Are you ready?” then told me the amount of the offer. I excused myself, got up and closed the office door, then shouted, “ARE YOU F%#KING KIDDING ME? !” I don’t actually remember what else I said after that, though I do recall it involved a lot of gibbering and giddy squealing. (Best. Day. Ever.) Then, over the next few days as three different publishers bid on it in an auction, L called to give me periodic updates. Things happened so fast, with so many details involved, that my head was soon spinning. L always took the time to explain who was offering what, what the various configurations of advance meant, how the royalties would work, etc. When I asked questions, or simply babbled in excitement, she was never too busy to deal with it, and she gave me her honest opinions about all of it — but still made sure the decision-ball was in my court. When the final deal was made, she introduced me to my new editor and walked me through the next steps. Seriously, I can’t imagine how any author, especially a new one, could function without an agent like this. Here’s a chance to have your project reviewed by one of the agents at The Knight Agency. Submit three compelling sentences (150 words max) about your completed, unpublished manuscript to submissions @ knightagency.net (delete spaces). Write BOOK IN A NUTSHELL in the subject line or it will not be deemed elligible. One submission per project, please. Twenty of the best submissions will be chosen and requested by various agents who will then give feedback on your work…and it may even lead to possible representation. Hurry, the deadline is April 20, 2009. Winners will be notified by May 1, 2009. My agent search involved sending out large-envelope packets in waves of 10, each containing a letter, synopsis, sample chapters, and so forth. Cost a lot in time, paper supplies, and postage, and was a general PITA. I wish it had been as easy as sending an email. So if you’re looking for an agent, hop to it! 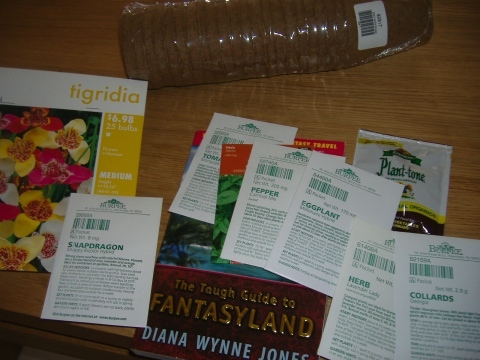 …And no, I’m not planting The Tough Guide to Fantasyland. Shall post updates on what, if anything, grows. I am REALLY curious what would happen if you planted The Tough Guide to Fantasyland. Hey, thanks for the info on the contest (and on your agent’s awesomeness :)).